Leverage a partner. Since the new foundation is all about achieving fresh-faced perfection while on-the-go, Maybelline saw an opportunity to partner with headphone company FRENDS. Not only did this partnership help emphasize the brand’s message, but it also increased the reach of the campaign. FRENDS followers were driven to the Maybelline site to sign up for the sweepstakes, increasing site traffic. Embed on site. 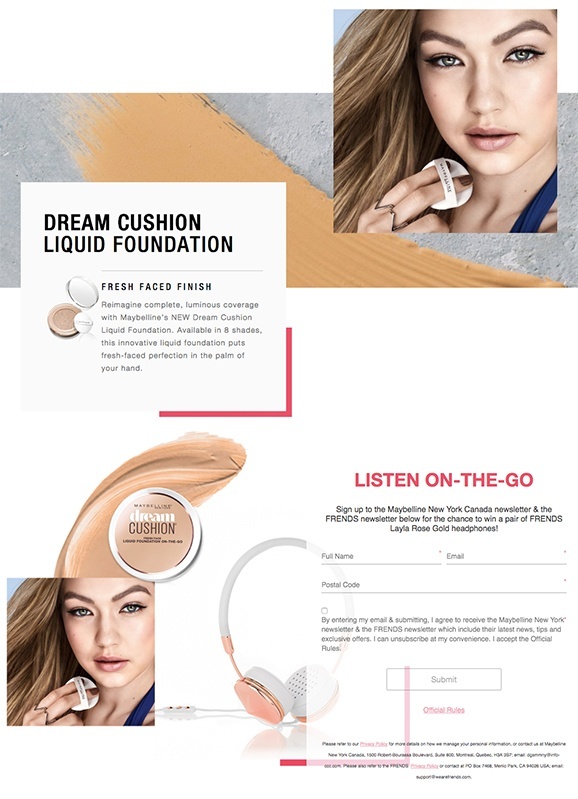 Maybelline promoted their new Dream Cushion Foundation and kept consumers on site by embedding the campaign into their homepage. By using the Sampling template, the brand was able to have the visual of the product on the left and keep the form to the right, which made the campaign look and feel like a part of the site, as opposed to an embedded module. Keep it simple. Since Maybelline New York’s primary goal in running this campaign was email acquisition, it was smart for them to keep it simple. By keeping the form to a very limited number of fields, thereby keeping the barrier to entry low, they made it easier for consumers to enter the contest, increasing the likelihood of the opt-in.